The RR bridges hazards are located immediately downstream of the existing RR bridges. Each has, in the middle, essentially an entire span turned over on its' side so that the rail bed and ties are like picket fences in the river. Shouldn't RRs have to put up warning signs on a segment of river where boating should be increasing? Can that be recommended to the COE? Pictures taken at approximately 4500CFS, stage 6.8 feet at Sardou gage. The western most RR bridge (immediately upstream of Topeka Ave). Middle and North spans have obstructions that are a hazard at all flows, safe passage only on river right, south bank. Fortunately main flow is on the south bank, but as bridge spans and the kaw go it is a fairly narrow passage. 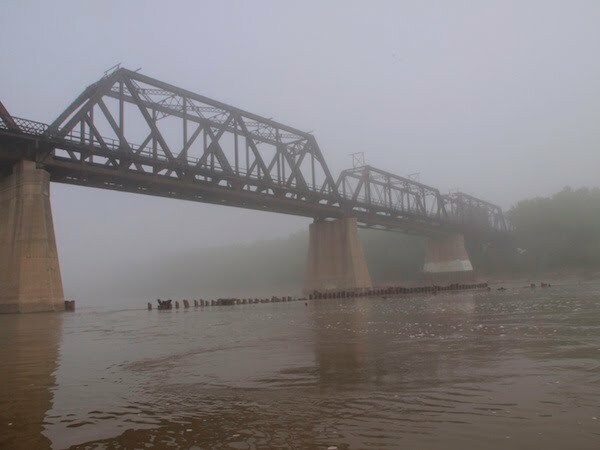 The eastern most RR bridge (immediately downstream of the Kansas Ave. bridge). The Middle and North spans have obstructions that are a hazard at all flows, safe passage on river right, south bank. Again flow is on the south bank fortunately and the safe passage is a wider. The picture is taken looking back at it. There also some things that might be considered obstacles which could be a form of hazard that pretty fixed in location unlike dead tree strainers and sawyers. These are like storm sewer outlet structures that may have been eroded out of the bank and washed downstream in one of the big events. I think we can agree that this is neither obstacle or hazard, unless of course it is used improperly. I floated it yesterday. Right at 3 miles, 3mile/hour ave. 1 hour long. At the time the flow was around 4500CFS and the stage height at Sardou gage was around 6.8. I continued on to Seward a little less than 11 miles total. I was on the river once with craig in extreme fog (perry to lawrence), but I think this was either denser or longer lasting. If you were in the middle of the river you could barely make out either bank. 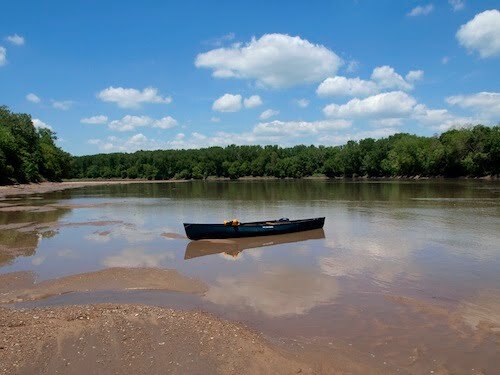 Kind of fun in an unfamiliar river reach. 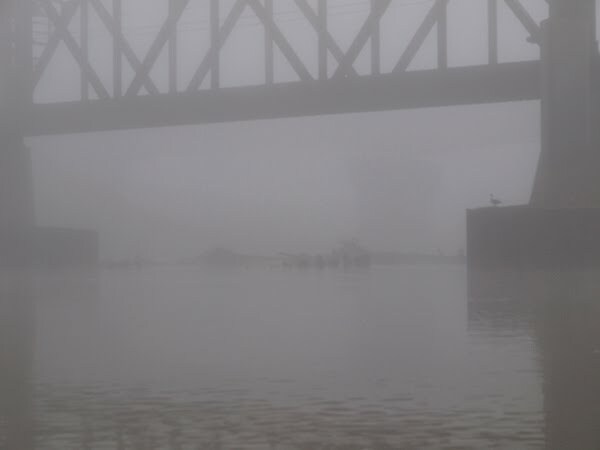 The fog was sooooo thick that Topeka looked beautiful on both banks, it didn't lift until I was a mile below Sardou Ave. bridge. FYI, the south bank under the Sardou bridge looked like the easiest walk up to the levee. Graveled slope under the bridge up to the levee. If there are problems with the Kansas Ave take out this would be the best alternative I've seen. It would be pretty much the same in all weather and any flow. Maybe I can send a picture. Didn't notice anything too unusual on discharges. Hills puts out a pretty good volume, not sure if it is cooling water or some sort of process water. Picked up a bit of effluent odor from Oakland on the river a couple miles downstream. I have a calibrated nose for muncipal effluent. I think a lot of people would just think it was the river, but I find it pretty distinctive and it isn't uncommon to be able to smell it 4-5 miles downstream from a major discharge. 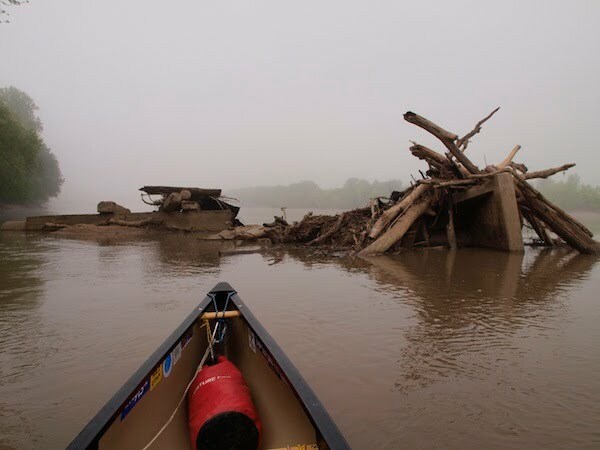 As for the RR bridge wreckage, I think we should list them as hazards, especially the downstream bridge. You need to keep to extreme river right (south bank) at all flows. The middle span has essentially a railroad tie picket fence that yesterday was sticking out of the water 1-2 feet and today would barely be under the surface.